1. 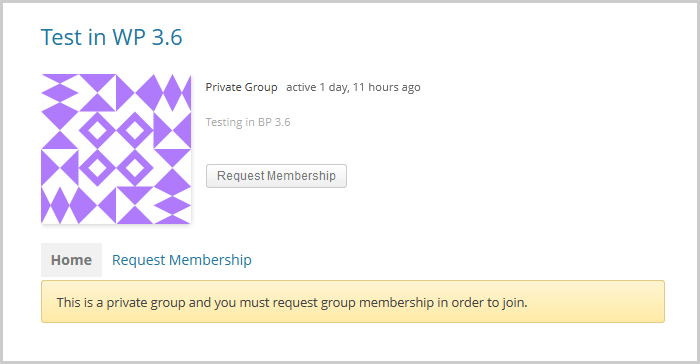 In your site’s Group Directory page, click on the “Request Membership” button of the Private Group you want to join. 2. You’ll see the “Request Membership” text in button change to “Membership Requested”. 3. 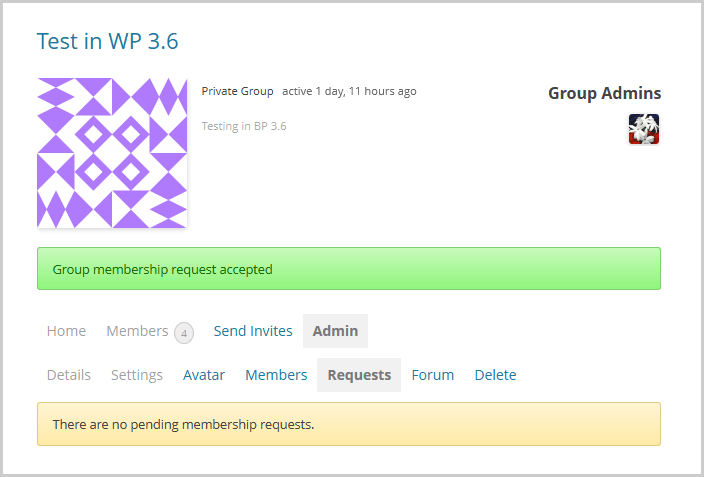 Your request to join the group is sent to the Private Group’s Admin via email (if enabled) and via notification in the Group Admin’s BuddyPress member navigation in the WordPress Toolbar shown below. 4. When the Group Admin of that private group clicks on the notification link in WP Toolbar or the link in the email notification received, the Group Admin is brought to the private group’s Admin > Requests screen. The Group Admin can either click on the “Accept” button or the “Reject” button. 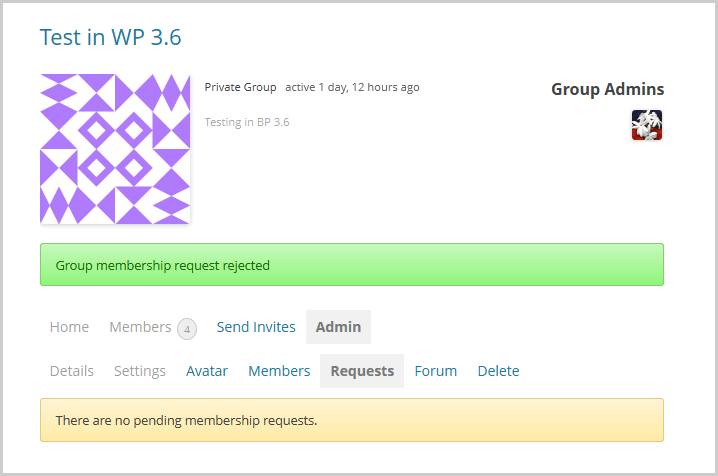 In this example, the Group Admin will choose to reject the request for group membership. 6. 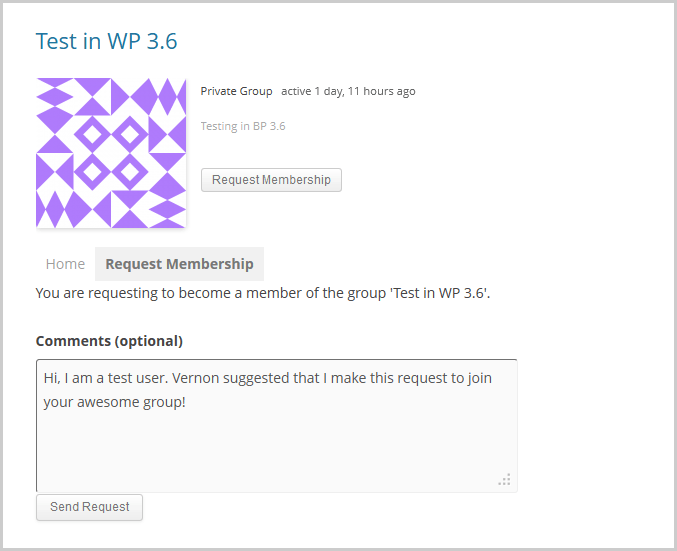 The member whose request has been rejected receives an email (if enabled) and notification in the WP Toolbar which when opened shows: Membership for group “name_of_group” rejected. 1. If you want to attach a message to the Group Admin when you request membership to join the private group, going to the private group’s home page is the option to choose. Click on the “Request Membership” button or on the “Request Membership” tab in the private group’s header area. 2. A textarea will show up so you could add your message to the Group Admin. Click on the “Send Message” button to send the message along with the request for membership in the private group. 4. 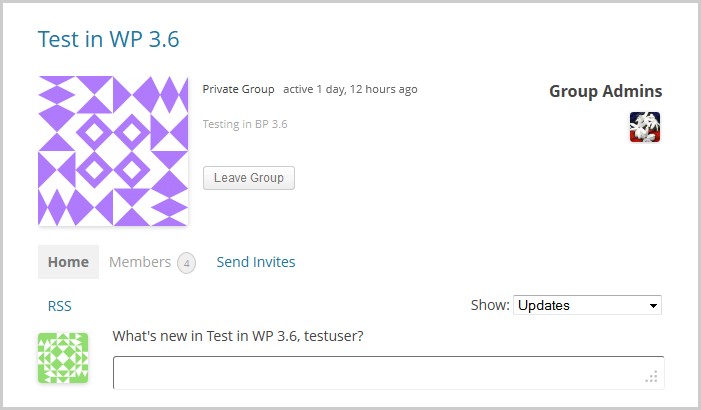 Your request to join the group is sent to the Private Group’s Admin via email (if enabled) and via notification in the Group Admin’s BuddyPress member navigation in the WordPress Toolbar shown below. 5. When the Group Admin of that private group clicks on the notification link in WP Toolbar or the link in the email notification received, the Group Admin is brought to the private group’s Admin > Requests screen. 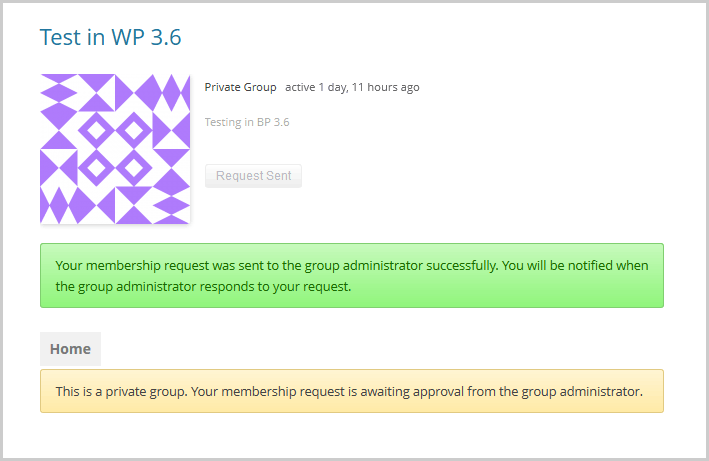 The message of the member requesting the membership is shown along with the “Accept” button or the “Reject” buttons. 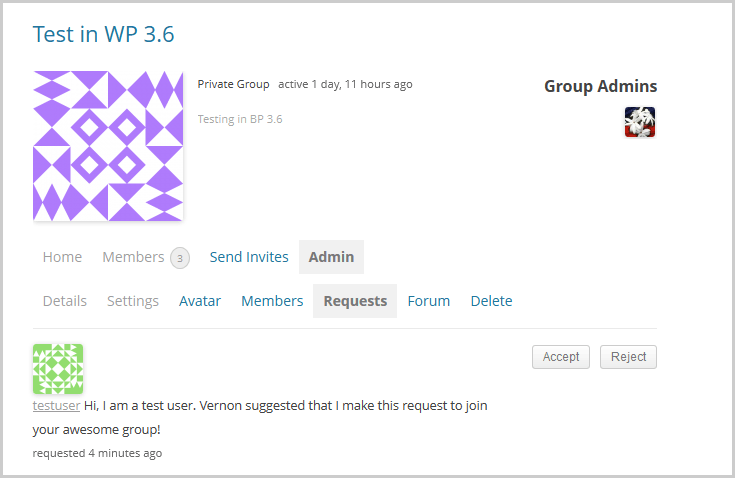 In this example, the Group Admin will choose to accept the request for group membership. 7. 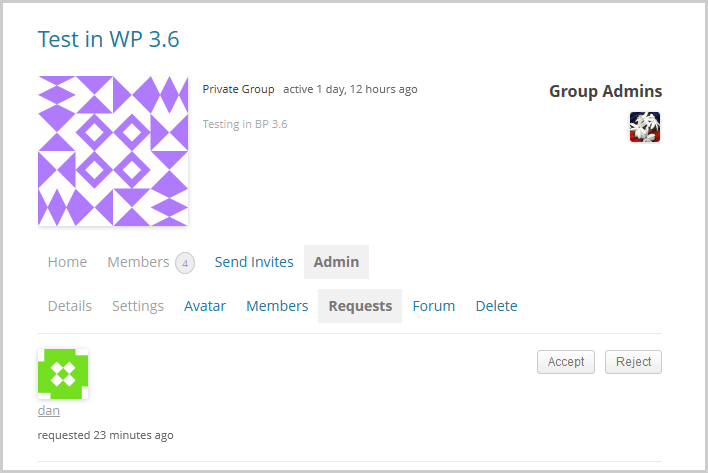 The member who applied for membership in the private group receives an email (if enabled) and a notification on site in the WP Toolbar which when clicked on shows: Membership for “name_of_group” accepted. 8. When the member who got accepted to the private group clicks on the notification, the member is redirected to the private group’s home page – the private group’s activity screen.